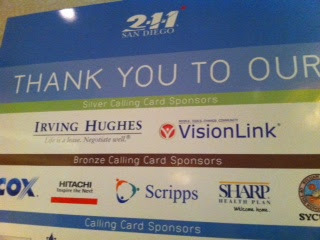 We are pleased to be a sponsor of San Diego's 2-1-1, Five-Year Celebration today. San Diego 2-1-1 is a thought leader for 2-1-1s and information and referral across the nation. They are focused on the business processes of success, a "hub" model of community resources where their 2-1-1 resources can be leveraged in support of many, many organizations and initiatives across their service area, and on an expanding revenue stream leveraged to support those in need. VisionLink joins a number of other sponsors including Qualcomm, Sand Diego Gas & Electric, Bank of America, Hitachi, The Leichtag Family Foundation, SDGE, inContact, and many others. View more information here. We are also very proud, of course, to deploy our CommunityOS software solution for their 2-1-1 call center and resource directory operations. Congratulations on a sold out celebration and fund-raising luncheon!